Tonight we play a dangerous but damaged Stoke side at home in the Premier League. A win is crucial for us as we are in the race just to get into the top 4. Stoke have had a great run until very recently and beat us in the reverse fixture comfortably. However, in recent times they’ve suffered two heavy losses exiting both the FA and the Capital One cup. In addition to that, they lost their most recent Premier League match. United have had a bad season all in all. 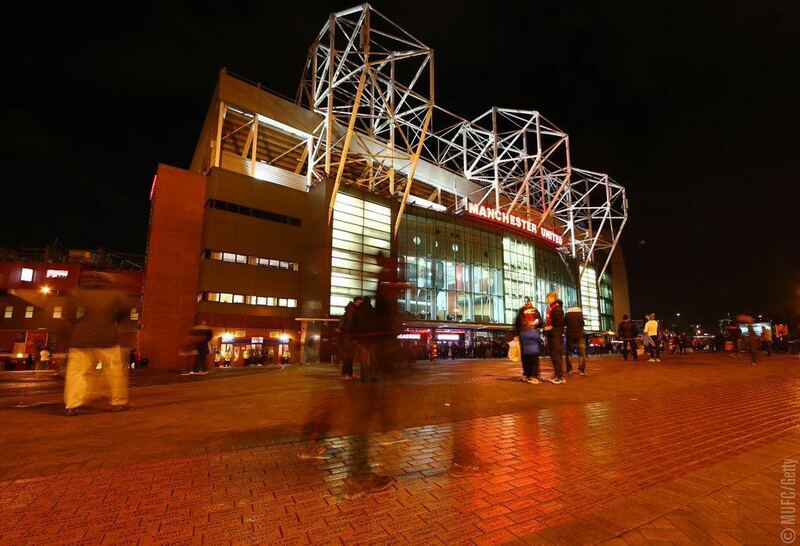 We’ve missed exciting football and much speculation has been placed over Van Gaal’s future at the club due to this. There have been signs of good football at times, but the results have been mediocre for normal teams, let alone for us. There were flashes of some good football against Newcastle, and against Derby but we need to do more against proven sides in the Premier League. Rojo, Young, Shaw and Valencia are injured leaving us with very little in the way of options at the back. 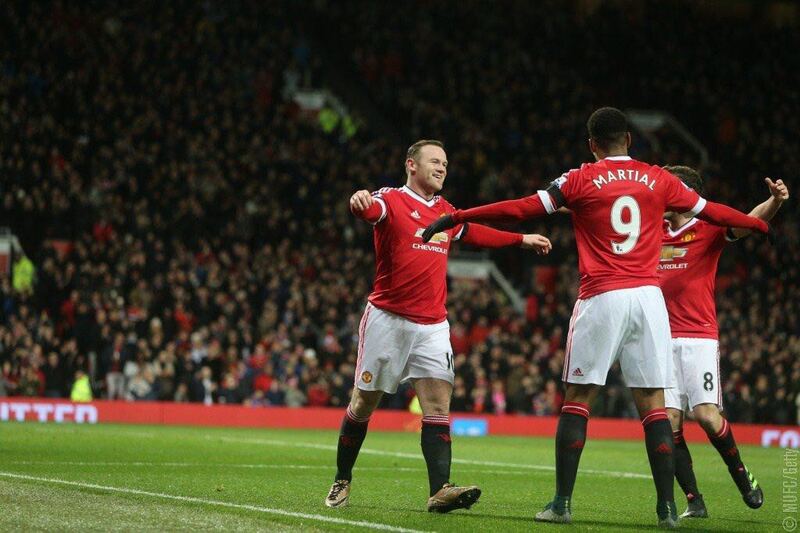 Rooney continues his exquisite form after a poor start to the season and Martial has been brilliant since joining us. I had hoped that Januzaj would have made an appearance against Derby seeing as we have recalled him from loan. 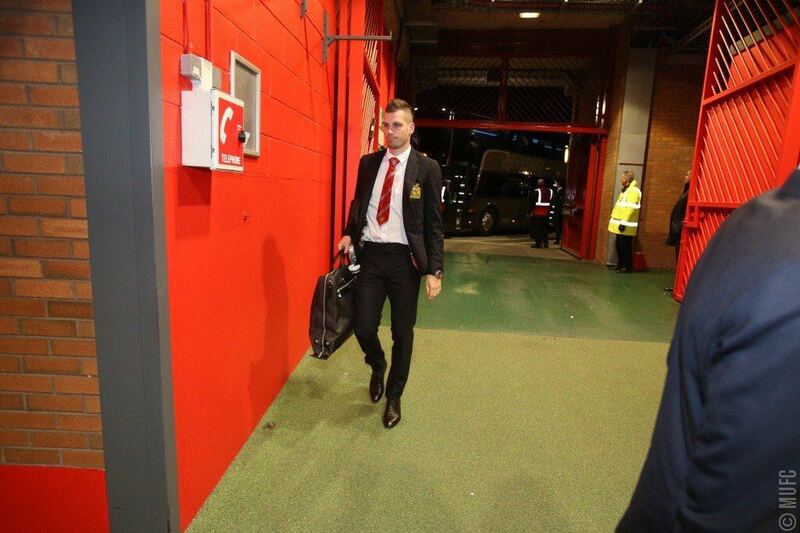 He's still young and needs to be given some game time to improve - so it will be interesting to see if Van Gaal gives him game time today, but it's unlikely as he featured for the U21s last night. As for Stoke, they will be looking to sit back and strike on the counter or use their target man, Arnautovic from set pieces. We are getting close to the part of the season where every point matters, and since we have been so happy to give points away in the first half of the season (especially through draws) we can't afford any slip ups. 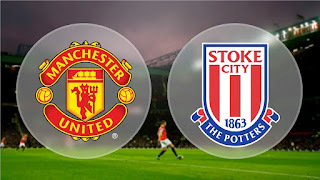 Stoke are a good side and the match will be physical, but we can and need to win. P.S. From all of us here at The United Devils, we would like to thank Nemanja Vidic for the dedication he put in day in day out. He was a true warrior that would put his body on the line every match, and he formed one half of one of the greatest defensive partnership in Premier League history. The world of football will miss him on the pitch, so we hope we see him in a pundit position soon or even a defensive coach for us! There will never be another like him. 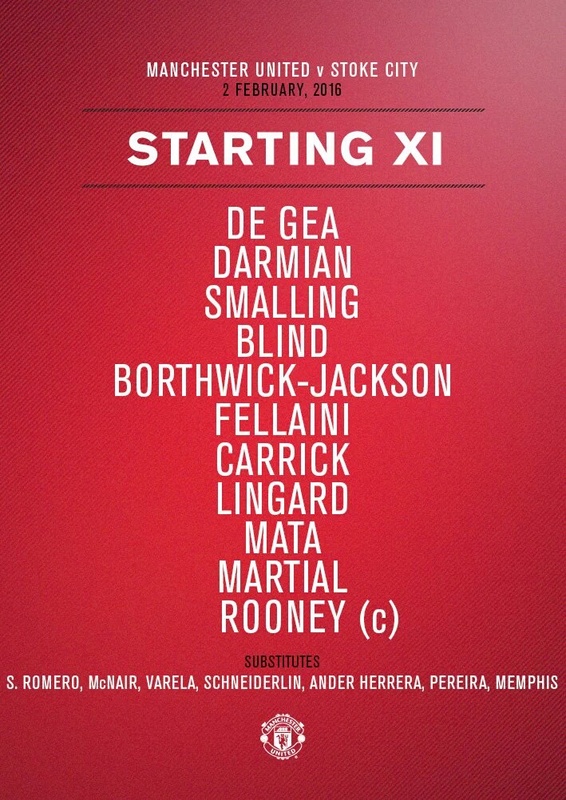 After a good game against Derby, we only make two changes, Darmian replacing Varela in the starting line-up and Carrick replacing Schneiderlin. Lets hope that our defence can keep a clean sheet today! In left back we have Cameron Bortwick-Jackson starting tonight. It's his 19th birthday today and the manager believes that he deserves the chance to prove himself once again on the big stage. Hopefully Daley Blind will be in great confidence after bagging himself a goal on Friday. Hopefully, once Jones is fully recovered, it will give Blind the chance to step up into the CDM role where he can show of his creative passes even more and get forward. One problem with this midfield is the strong legs that are capable to run box-to-box. Lets face it, Carrick and Fellaini aren't our fittest and youngest player so it will be hard for them to keep up with the game. I wouldn't be surprised to see Schneiderlin and/or Herrera come on later in the game for a pair of fresh legs. Our front line remains unchanged from the relatively attacking performance against Derby. 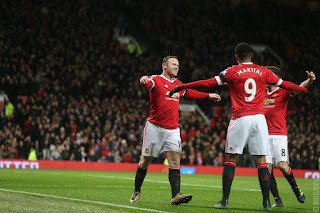 Anthony Martial will be looking to make a large impact again after wining man of the match in the last game, and Wayne Rooney will be hoping to continue his extraordinary form from the last few games. What a half! Manchester United came into the game needing a win which would only come from scoring goals and surprisingly Manchester United have scored. Twice. In the first half. Without conceding. 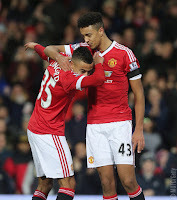 The first goal was a simple header in the back of the net, and it came from the Stoke defenders falling asleep and failing to mark Jesse Lingard who got his head behind a beautiful cross from the young Borthwick-Jackson. Initially it was great link up play from Martial and Borthwick-Jackson. 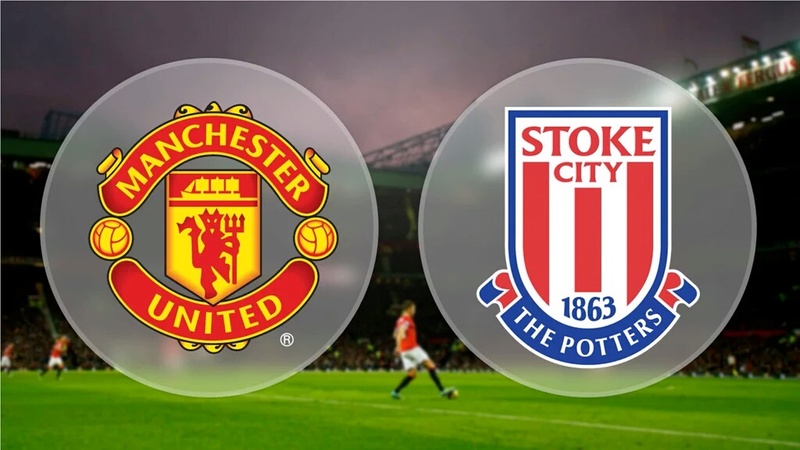 There was hunger from Rooney, Mata and Lingard to make the run forward and thus push the Stoke defenders back which most likely blurred the vision of the in-form Butland. Not even he could stop this header. 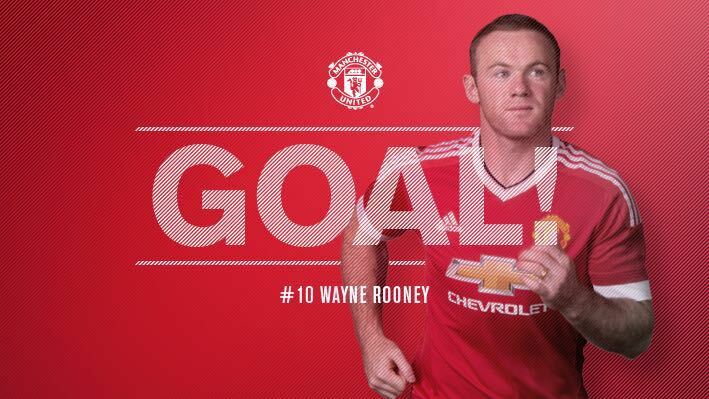 The second goal was hit on the counter and is the exact football that us United fans want to see. Darmian putting in a hard tackle to get the ball from Affellay and then giving it to Mata who exquisitely skilled both of his markers with a perfect turn. Rooney who has been in the best form he has been on in a long time, then received the ball and with one look up passed it to the unmarked Martial. The finish on that is something the more experienced and world class strikers would be doing! The likes of Lewandowski and Ibrahimovic would be proud of that shot. Our goalkeeper was rarely tested as the Stoke attackers have been put to the physical test, battling against Smalling, Darmian and Blind. Smalling has been solid and Blind likewise. Darmian has picked up his game majorly in the last couple of games and is showing why he deserves to be a right back for Manchester United. He and Varela will be great to watch in the future! Congratulations to Borthwick-Jackson who registered his first ever assist, and what a cross it was! Beat both of the Stoke CB's. Let's carry this quick paced attacking play on into the second half! The second half wasn't as exciting as the first half and understandably so. 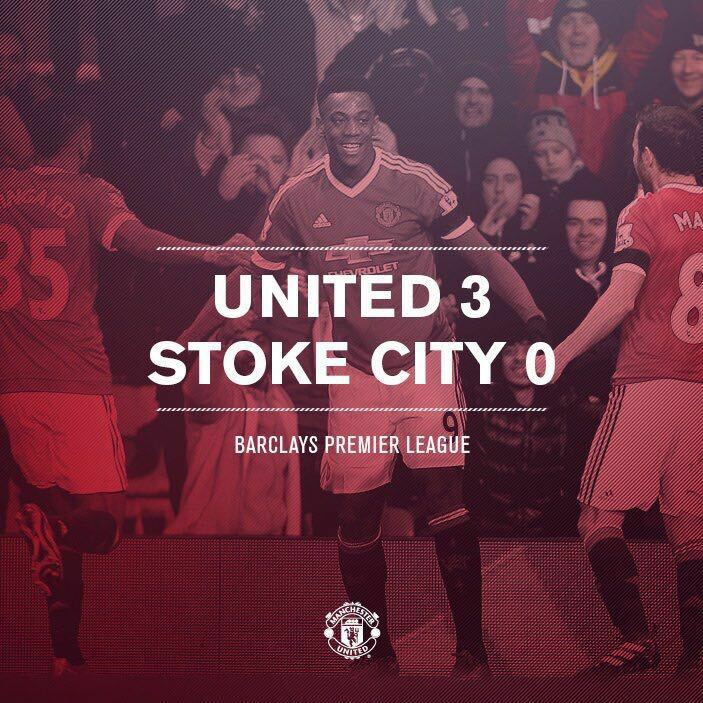 Louis Van Gaal doesn't like to take risks after being handed such a crucial lead on Stoke who aren't a bad team and have a lot of scoring potential. Rooney more notably played more deeper which is why LVG took Mata off for Pereira, who finally got some much needed game time to help develop him. Stoke seemed to have forgotten that they had strikers, they were on the back foot from the start of the half all the way to the end and credit is due to Carrick who seemed silent but made sure to rally and organise the team defensively alongside the two CB's. Rooney's first chance of the half was buried with a great finish from close range but was not given because of a shoulder barge which did seem excessive. However he was rewarded for his patience with another goal which counted. Mata making a good run through the middle, he's been essential in our counter attacks when he plays in his more favourable position, he picked a good pass to Martial who used his skill and pace to run down the left flank and cut back with a pass to Rooney who tapped it in. 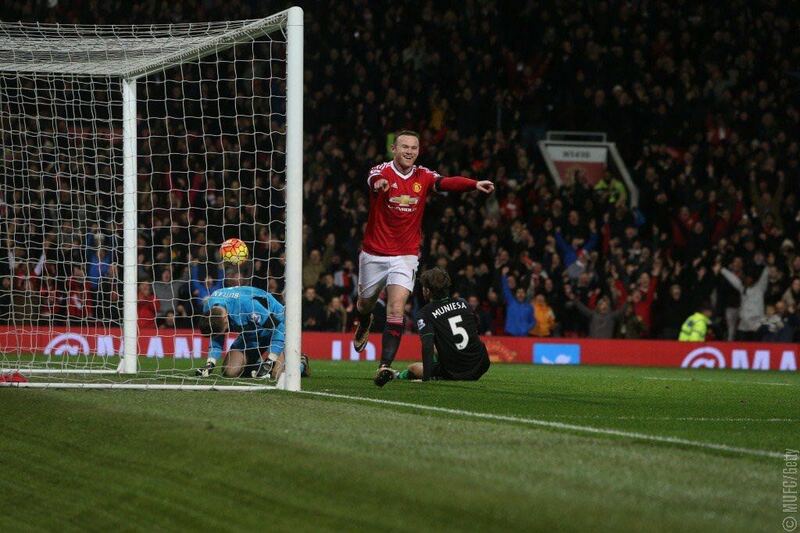 Rooney has finally found his scoring boots and has forgotten about that horrid start he had to the season. Let's hope he can continue and lead from the front like a real captain. Defensively we were sound, our two full backs keeping their men bound and always getting that crucial tackle. 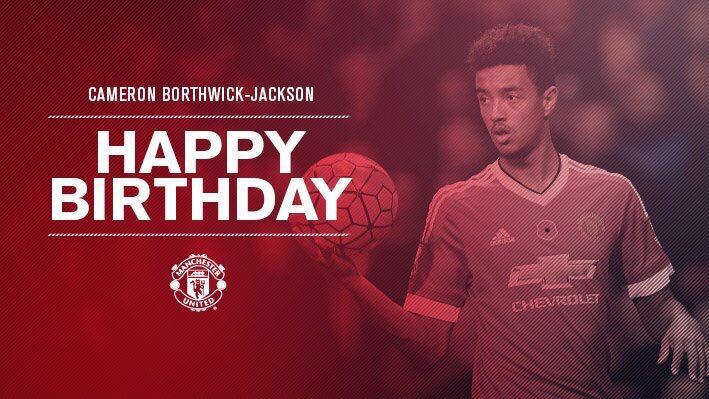 This is great stuff to see from Borthwick-Jackson at a relatively young age, it will help his development. Smalling had a difficult job of keeping the massive Crouch on lock down and he did a great job. He made sure to give him a real hard time physically and made sure that he won (somehow) most of the headers coming his way. Darmian kept the silent, but potentially lethal, Arnoutavic completely isolated. He was forced to go really deep to get a touch of the ball. Great improvement by him. Memphis got some minutes and he's shown some improvement as he nearly scored! However much more is needed if he's to become a regular starter in starting XI. Overall, it was a stark improvement from the Southampton game and it's great to see the team carrying on the confidence which was gained from the victory at Derby. 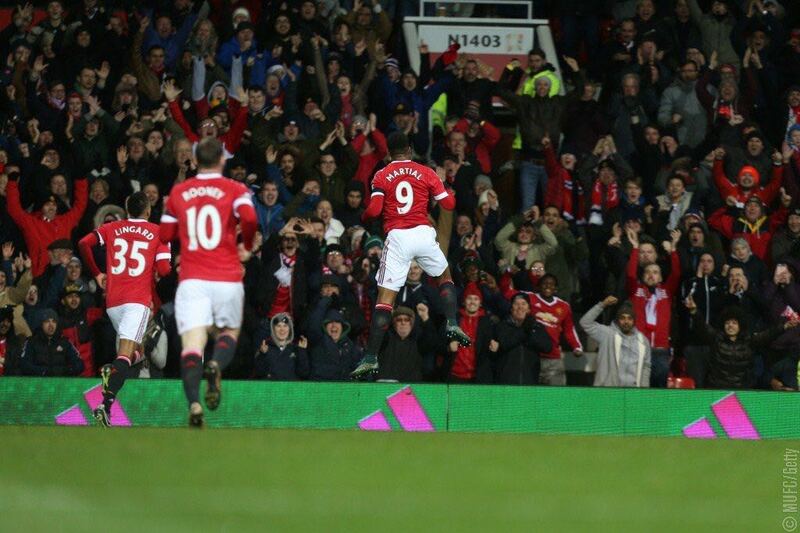 The man of the match has to be Martial for his beautiful goal and for getting an assist. He showed signs of slowing down from the explosive form he greeted the premier league however that seems to be a facade as the goals and other contributions are all coming back. Cameron Borthwick-Jackson has to be a close second as even though he didn't score he set up Lingard with an unstoppable cross and didn't stop there as he kept on whipping balls in, in danger spots however no other players were able to get behind them. He made sure Pieters didn't even get a proper dribble with the ball which is great as Pieters has a great physical presence. For the next game against Chelsea, we need to carry this form on and establish a good run of victories. This may be able to bring back the fans trust of Louis Van Gaal and it could get us the fourth, or even third, Champions league spot. Smalling will have to rise up again and hold Costa down and isolate him so he doesn't get any chances to score. 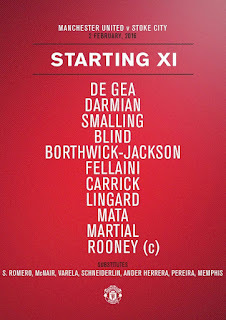 Furthermore, I believe Fellaini should be dropped and Schneirderlin should play in order to shackle Fabregas. Schneirderlin is also great defensively and is strong. 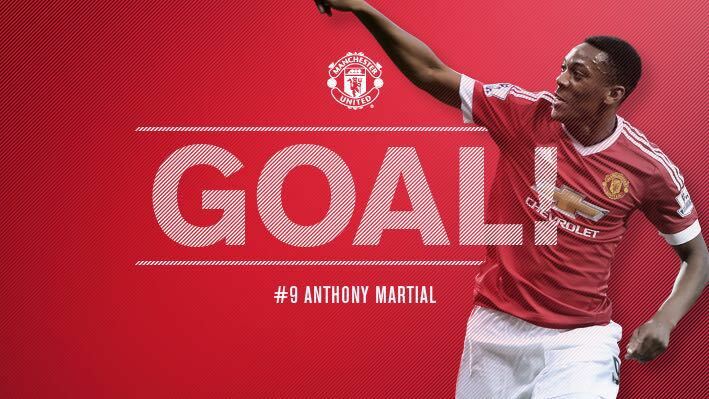 Louis Van Gaal should also focus more on Chelsea's Ivanovic and the man to do this is none other than Martial. With the form Martial's in right now and Ivanovic's drop in form this season, the results could be explosive. After the terrible injury he suffered against Southampton, he put in a good shift today and was solid on his return. Not too much for our star defender to do today. Stoke didn't have much of a threat going forward but was solid and good on the ball when coming out from the back. As usual, Blind has been making some great passes forward from the back, and was solid defensively today. Despite all the criticism, this man was solid today and put in an amazing performance. He's been great in the air and on the ball. He was substituted due to what looked like an injury, hopefully it's nothing too serious. 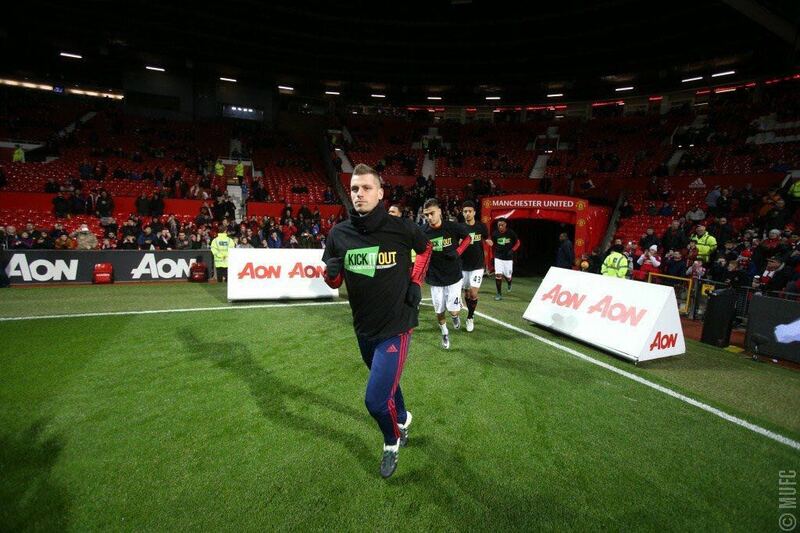 One thing which he won't forget is the ovation which he got from the fans. Similar to last season, Carrick has been like a good-luck charm for us. His intelligence of the game is exceptional and we are privileged to have him. You're probably wondering why I've rated him so highly... Despite missing a few huge chances, he managed to get a hat-trick of assisting the assist - this shows that he was involved in the build up of all 3 goals. Once again, it was a night to remember for the young Frenchman. He did say in his press conference that he loves to assist and score and he done both today. 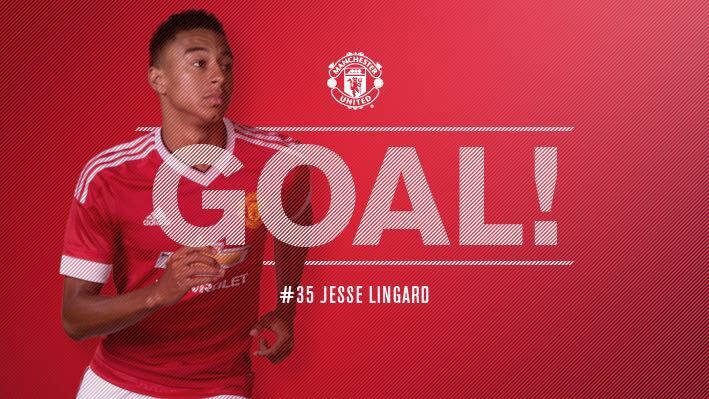 His goal was the highlight, what a perfect, world class finish from the young lad! The good form of 2016 carries on for our skipper. It is now 7 goals in 7 games! When seeing his name in the starting line-up, i was worried. But he has shown today his love and dedication for the football club and he managed to nick a goal along the way!